bulldozer operator uncovered a pine coffin in an old beaver swamp down the road from Allen C. Shelton’s farm. He quickly reburied it, but Shelton, a friend of Keim’s who had a suitcase of his unfinished projects, became convinced that his friend wasn’t dead and fixed in the ground, but moving between this world and the next in a traveling coffin in search of his incomplete work.In Where the North Sea Touches Alabama, Shelton ushers us into realms of fantasy, revelation, and reflection, paced with a slow unfurling of magical correspondences. Though he is trained as a sociologist, this is a genre-crossing work of literature, a two-sided ethnography: one from the world of the living and the other from the world of the dead.What follows isn’t a ghost story but an exciting and extraordinary kind of narrative. The psycho-sociological landscape that Shelton constructs for his reader is as evocative of Kafka, Bataille, and Benjamin as it is of Weber, Foucault, and Marx. 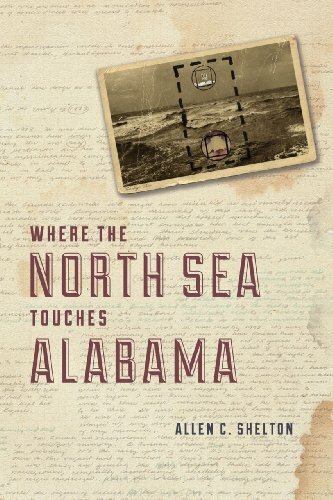 Where the North Sea Touches Alabama is a work of sociological fictocriticism that explores not only the author’s relationship to the artist but his physical, historical, and social relationship to northeastern Alabama, in rare style.